The Part 11 Toolkit includes a customizable search engine, which allows all users to safely retrieve information from the database without any possibility of corrupting or altering system data. Users select a search source and enter their desired search criteria. Users can search for specific strings, NULL fields, user-created expressions, and lists. The screen automatically displays the search results, including the number of results. Once results are displayed, they can be exported to pdf or Excel. All queries are read-only; creating a custom query does not affect the validation status of the database. Developers can create additional search queries and link these queries to specific reports for display. 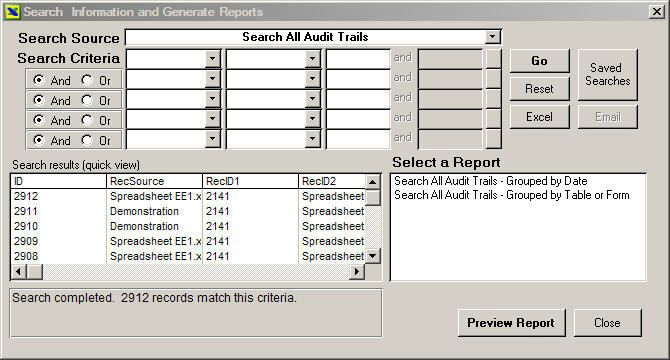 The Search Information and Generate Reports screen helps demonstrate compliance with 21 CFR 11.10(b), Generating Accurate and Complete Records.